From apartments and cars to clothing and furniture, huge numbers of the "Recession Generation" (20- to 34-year-olds) are choosing to rent their possessions, according to Bloomberg. It's understandable -- in the wake of the Great Recession, the jobless rate has topped 8% for three years, student-loan debt totals $1 trillion, and among those able to get jobs right out of school, the median starting salary is a measly $27,000. All while the real costs of many everyday goods have risen. 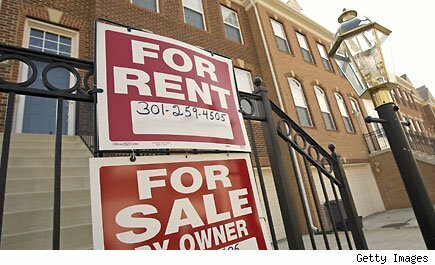 But does it actually make sense to rent long term, rather than buy? I've written before about why buying a home isn't always the best choice from an investment standpoint. But buying a home is more than just an investment. Because of low interest rates and home prices that have risen more slowly than rents, buying is now cheaper than renting -- a whopping 45% cheaper in the 100 largest U.S. metro areas, on average, according to Trulia. So, from a purely based-on-the-numbers standpoint, right now it makes more sense to buy rather than rent. Except when it doesn't. First, you have to qualify for a mortgage, which may not be easy for those drowning in student loans or who racked up credit card debt during their college years (or years searching for a job). You'll also need to have a down payment, which, for most, is the difficult part. As Trulia's chief economist explains, "It may be 56% cheaper to buy than to rent in Denver, for instance, but it takes more than 8 years to save enough for a down payment there." So while buying a home is clearly cheaper, it may not be a feasible choice if your finances are in turmoil -- or if you want the ability to easily move. Cars are a different story. As The Atlantic reports, "The typical new car costs $30,000 and sits in a garage or parking spot for 23 hours a day." Not to mention the maintenance, insurance, taxes, and refueling costs. The freedom of being able to go where you want when you want may be vital for some. But for an urban-centric demographic, that freedom isn't always necessary. Also consider that with low interest rates and a stalling used-car market, leasing is more attractive than it's ever been. Still, it's only marginally better than buying outright. That's why finding a used car and buying it makes the most sense if you absolutely need the mobility. For everyone else, a membership in a car-sharing program like Zipcar (ZIP) is usually the cheapest option. The trade-off you make when renting furniture and clothes is paying a hefty fee to borrow items that you wouldn't otherwise be able to afford at all. Unfortunately, over time, you spend way more on these rentals than you would if you simply purchased the items to keep, with the added bonus of being able to sell down the road, if you choose. Checking out the website for CORT (a furniture rental company), full home packages range from $218 to $551 a month -- equating to between $2,616 and $6,612 a year. That's a serious chunk of change for a budget-conscious young adult. Instead, you'd be better off checking out Craigslist, thrift stores, and other secondhand retailers to cheaply furnish your home. As far as clothing rentals, one of the most popular sources is Rent the Runway, a service similar to Netflix (NFLX), which allows you to rent designer outfits for 10% of their retail cost for a four-day or eight-day period. It's certainly a way to save money for a one-time event (wedding, Christmas party, etc.) but here again, you're likely to find better deals at a local thrift shop or secondhand clothing store. Financially speaking, in every case except for automobiles, buying usually makes the most sense for the Recession Generation. But the trade-offs aren't minor: Owning means you sacrifice the luxury of being able to easily trade off to a brand-new, up-to-the minute item. And owning also limits the freedom that comes with not being tied down by things that are hard to sell. Ultimately, you have to decide which is more important to you -- your money, or your freedom. Which camp do you fall into -- do you prefer buying outright or renting? Tell us in the comments below. This article was written by Motley Fool analyst Adam J. Wiederman. The Motley Fool owns shares of Zipcar and Netflix. Motley Fool newsletter services have recommended buying shares of Zipcar and Netflix, as well as creating a bear put ladder position in Netflix.